We Need The Eggs: How Stupid Are We? I'm not being cute. Seriously, how stupid are we? What you have to remember about these types of things is that Miller didn't just decided to take a stab in the dark. They tested this concept with people and enough of them told Miller that it was a good idea. Enough of them said, "Yes, if you make the beer swirl into my mouth I will be more likely to buy your product." Holy hell. It's horrifying, isn't it? 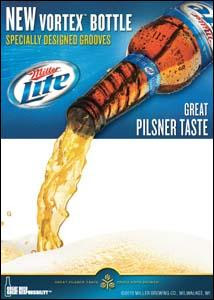 I mean, ever lite beer from every brand already tastes basically the same anyway, but you and I live in a world where making crappy beer swirl slightly out of a bottle will earn a company millions and millions of extra dollars. And it's our fault. We can't laugh at Miller, they're only giving us what we're demanding. Here in America, We Want Beer That Swirls.